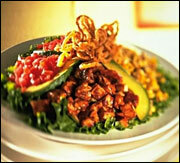 Rumor - When dining out, it's always best to stick with a salad. Reality - Restaurant salads can sometimes be the worst items on the menu! If you don't believe us, check out these salad shockers! Just because your plate starts off with leafy greens doesn't mean it's a good choice. Globs of oily or creamy dressing can cause calorie counts to skyrocket. And mounds of fatty salad toppers like cheese, nuts, and fried noodles are BAD news! Rather than sticking strictly with salads, scope out the entire menu for something that has lots of veggies and lean protein. Avoid dishes that are extra-saucy or fried. And if you DO get a salad, skip the fatty toppings, and ask for the dressing on the side -- then dip, don't pour (you'll likely use far less that way)! Rumor - If you want to lose weight, you need to avoid the stuff you crave (chocolate, chips, etc.) at ALL costs! Reality - Depriving yourself can actually lead you to abandon your diet altogether! Although it is a good idea to limit trigger foods (stuff you KNOW you'll go overboard on), you can (and should) find guilt-free alternatives to your favorite snack foods for when the urge hits you hard. If you need a little chocolate now and then, try some of our guilt-free chocolate craving busters. If you can't live without fried food, give faux-frying a try -- HG's got recipes for everything from onion rings (155 calories, 1g fat and a PointsPlus® value of 4* per serving) to eggplant parm (170 calories, 2.5g fat and a PointsPlus® value of 4* per serving). It's much better to go with a balanced approach to eating that you can stick to than to swear off your favorite foods forever! Rumor - The more calories you cut from your daily diet, the more pounds you'll drop. Reality - Take in too few calories, and your body will go into starvation mode and cling to your extra lbs. for dear life. While nixing excess calories is key to weight loss, your body NEEDS a certain amount of calories each day. The exact amount varies depending on a whole slew of factors (from your age and weight to your activity level), but experts recommend that no one drop below 1,200 calories per day. Think of food and calories as fuel -- your body can't burn fat if it's running on empty. Taking in too few calories can cause your metabolism to slow down, and a sluggish metabolism makes it harder to lose weight. To get a better idea of how many calories your body needs, check out this calorie calculator from our pals at Calorie Count. 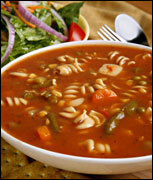 Rumor - Eating certain types of soup can promote weight loss. Reality - It's TRUE! Okay, this doesn't mean you can spend hours each day slurping up creamy chowders and bisques and lose weight. But studies have shown that when people start a meal with broth-based soup, they take in a whopping 20% FEWER calories overall at that meal! How cool is that!?! Go for soups that are low in calories & fat and high in fiber -- those'll fill you up without weighing you down. Click here for some of HG's latest favorites! Do carbs make you fat? Does water = weight loss? Will a vegetarian diet cause you to shed pounds? And should dairy be off-limits to calorie-counters? CLICK HERE for the 411! Should you stop eating at a certain time each night? Can you indulge as much as you want with something as long as it's fat-free or low-carb? What's the truth behind negative-calorie foods? Is margarine better than butter? Find out by clicking HERE! February is Great American Pie Month, people! Check out our Strawberry Cloud Pie and super-famous Too-Good-To-Deny Pumpkin Pie! Share this super-important email with everyone you know. They’ll be PSYCHED. Click “send to a friend” NOW!